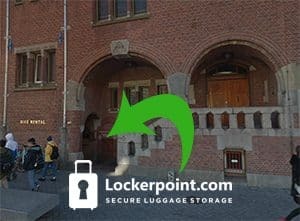 Lockerpoint Damrak in Amsterdam offers a safe luggage storage. It is located at the Beurs van Berlage (entrance under the bell tower at Holland Rent a Bike), a stone’s throw from Central Station, near the Dam, between the Bijenkorf and the Station. It is the perfect place to store your luggage, close to the Kalverstraat, (100 meters), the Red Light District, (350 meters), De Beurs van Berlage, (50 meters), The Amsterdam Dungeon, (600 meters), Nieuwmarkt, Waterlooplein, Rembrandtplein, Leidseplein and various other attractions are less than 300 meters away, (eg Madame Tussauds, De Nieuwe Kerk, tour boats and starting points for various cycling and walking tours). There is also a tram stop, (numbers 4, 19 and 24), right outside and all metro lines are within walking distance. Our large lockers are 78 centimeter (cm) deep, 56.5 centimeter (cm) high and 36 centimeter (cm) wide (note: the door opening is 32.5 centimeter (cm) wide). Our lockers often have space for several bags, two to three trolleys or a large suitcase. Luggage that does not fit can always be stored in our secure luggage room. At this moment it is only possible to reserve large lockers online (€8). If you want to rent a smaller locker (€6, suitable for backpacks), then come and visit us. See all opening hours of Lockerpoint Beurs van Berlage. Bicycle rental from EUR 8.50 per day, including insurance. Copy of credit card or EUR 150 deposit required. Different bike tours on request.